14/15 Season Two, Episode 17: Odds on a Dead Pigeon-Scarecrow and Mrs King | "Just walk with me.."
So…Brace yourselves.. sooo much goodness is ahead of us!!! Got your smelling salts?? 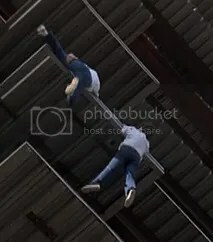 Lee has helped Amanda back up from the ledge, while Karen fell to her death. Lee and Amanda immediately cling to each other for a second here – things are spinning out of control! whoa.. It looks to me like Lee seems to have noticed Karen is kaput. He leans slightly towards the edge and has released Amanda with his left arm.. but still holds her with his right arm..
Amanda? she’s clinging for dear life [go for it Amanda! ] she really has had an awful shock! 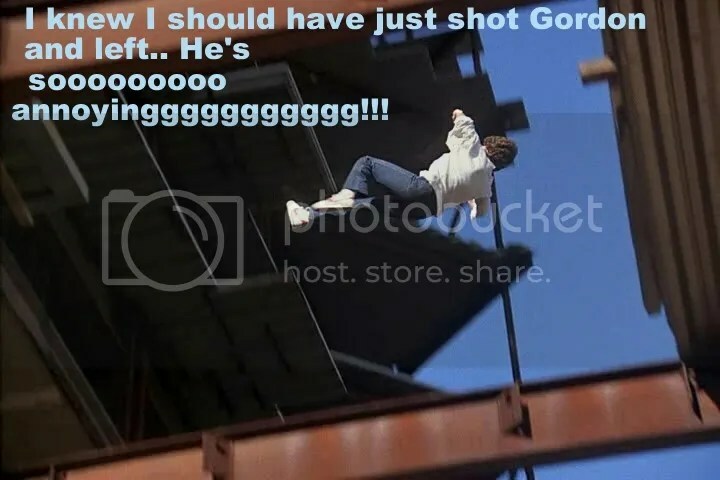 We cut to the view of Lee and finally see his reaction to all this.. he looks over the edge but Amanda chooses to avert her eyes..for now… Good idea Amanda..
We see Lee as he looks down on Karen’s dead body- he lingers there a moment.. I think this is hugely powerful- Lee isn’t looking down on Karen’s dead body: he doesn’t know what she looks like! he’s looking at Amanda’s!!!!! He looks horrified at what he sees.. I think that must be hugely shocking to see a body that looks just like Amanda: dead!!!! Knowing that if he had not known her so well- that could very well have been her- WOW!!!! I absolutely love the symbolism of this- they really milk the fact that Karen looks like Amanda for all it’s worth!!! great job Juanita Bartlett!!! I’m loving this ide a!!! Amanda never takes her hands off Lee! both of them stay firmly attached to him – awh!!! Back to the close up of Lee and Amanda..
Lee seems to look at Amanda like: you’re alive!!! that’s not you down there!!! They both silently look at each other for a moment- just stunned!!.. Lee grabs both of Amanda’s arms with his hands (that’s such a signature move between these two isn’t it!) Lee’s maybe wanting to feel her body in his arms and reassure himself she’s alright.. do you think neither is sure it’s okay to go in for another hug?? Lee is intense here! Amanda looks down at the ground.. trying to gather herself a little so she doesn’t drown in those arms, those eyes maybe?? thoughts anyone????!!! Lee is utterly fabulous here.. and doesn’t shy away from this tender, very real moment with Amanda.. goooo Lee!!! Amanda: How did you know it was me? I love that Amanda is of course happy to be alive.. but also happy that Lee knew who she was! Amanda smiles at him and Lee pauses a moment before answering..
Lee gives a little laugh and smiles before answering.. they both seem a little shy.. though totally connected..
…whose last words would be ‘ oh my gosh’! I love that this is how he knew –because I think first season Lee would have found it a bit cringe worthy that Amanda could be saying ‘oh my gosh’ as her life hanged in the balance.. but this Lee? – He seems pretty happy that Amanda is the way she is!! And he accepts her – and seems to like her a lot!!! I love that!!! More intense silent swoony looks.. and suddenly Amanda looses her smile..
yes she’s happy to be here with Lee.. and alive.. and it’s fun how he knew and wonderful.. but Amanda suddenly remembers Karen and glances down at the ground sad.. Lee doesn’t look again straight away: his eyes stay firmly fixed on Amanda awh.. I love this scene.. full of such raw, unfettered emotion!! His eyes follow Amanda’s.. and finally he glances again at what she sees..
Amanda must be feeling very confronted.. like Lee was at – that could have been her, and.. that’s what she would have looked like!! 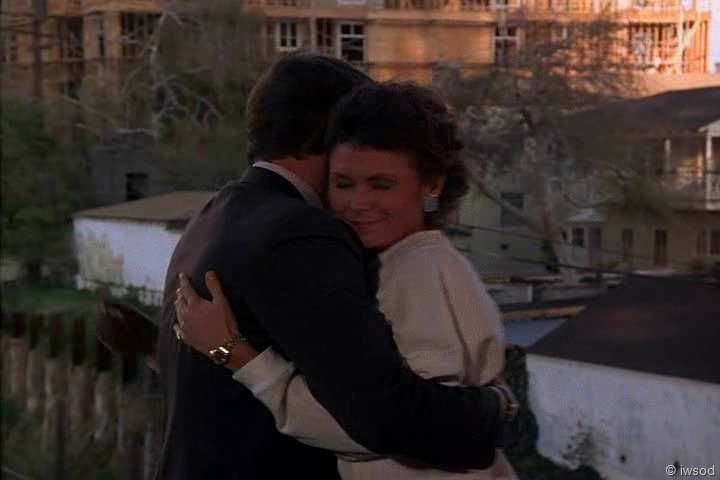 Overwhelmed, Amanda needs the sanctuary of Lee’s arms.. She turns back to Lee and seeks out this sanctuary- and he gladly comforts her..soooo sweet!!!! I think Lee whispers: come on. As he pulls her into his arms.. swoony!!! I do believe Lee comforting ly rocks her also! Smelling salts!!! I need smelling salts!!!! The scene ends here.. good thing too.. I think I was beginning to get overwhelmed by so much swooniness.. swoonynesss? LOL! Anyone wish we could see Lee’s expressions throughout this hug?? … I guess it’s enough that we can see how his body responds to Amanda- he’s completely open here and lovely! I think the tenderness is very touching (get it??!!! tee heee.. yes- emotionally and literally 😆 ) Lee hasn’t had much tenderness in his life.. and here they mutually comfort each other – in a tender, gentle way which is IMHO a growing moment for Lee emotionally – I think he is starting to find this being ‘really very sweet’ with Amanda is not so hard after all.. in fact.. it’s really rewarding, and meets a need in Lee he hadn’t realised he had. Have they hugged each other to comfort one another before????? Maybe I’m forgetting but I’m thinking the other hugs were joyful/exuberant only?? 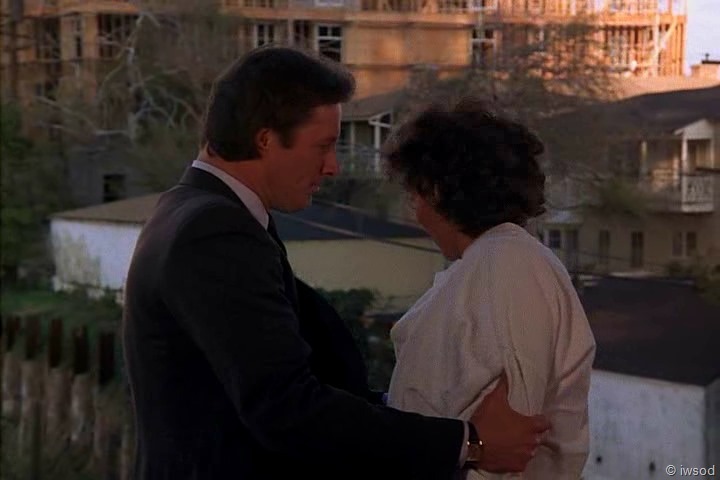 Except maybe the side hug in Ship of Spies on the beach when the bad guys have been caught.. but then.. Amanda kind of snuggles into Lee while he trains his gun on the baddies so.. not quite the same.. Anyone?? A mutual hug for comfort is much more vulnerable did I miss any? Oh and this one! [Tee hee!] A cover hug! think Lee is enjoying having such a close friendship with Amanda – a relationship he may not have had before.. someone he knows so very very well.. and who knows him for who he is (not just the superficially spunky guy he also is )..
Amanda is someone who he can comfort and be comforted by.. who he feels safe with and can share his troubles with – this is the take home message for me from this episode: Their mutual care, affection and enjoyment of each other- based on knowing and accepting who they really are and the knowledge that this friend of theirs is irreplaceable!!! Well I sure can’t wait to hear your thoughts everyone! Back to wrap up this episode and just what the title could mean soon!! 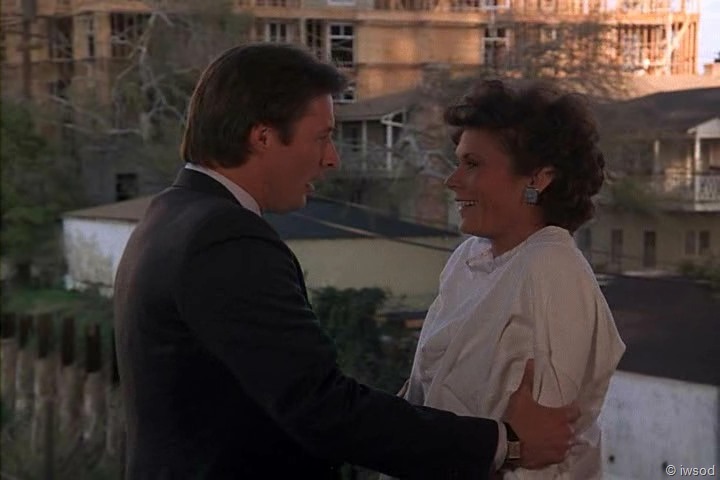 This entry was posted in Season Two and tagged recap, Scarecrow and Mrs King, SMK. Bookmark the permalink. Best scene out of this whole episode! 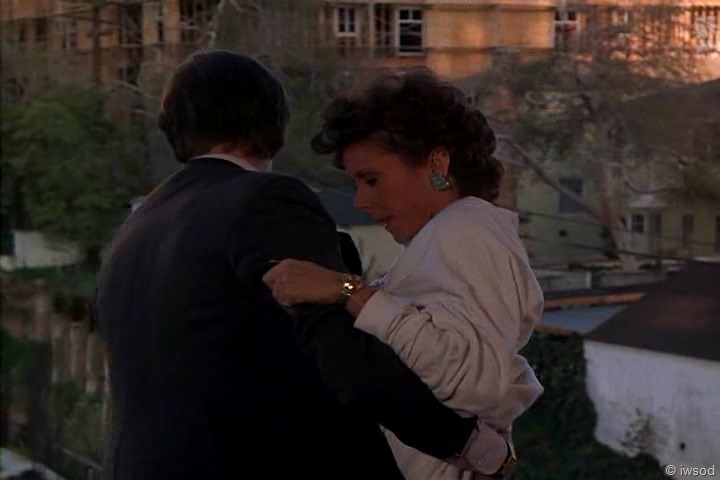 I love that Lee gives her that second hug and totally looks like he is hanging on for dear life…and he probably is…IMHO he is just realizing how much Amanda means to him! Irreplaceable. That is the word for the episode, I agree. It is one of the bullet points in the series of points that these last episodes of season 2 make for Lee. It is a check list from SOS on, at least its one way that I look at it. Spiderweb, she is trustworthy as a member of the agency, in RS she is trustworthy with Lee’s heart matters. In ALSALS she is a lady, in LOTP she is brave and here she is irreplaceable (did I forget one?). Maybe Lee just isn’t going to zone in on what the check list is for, yet… But Amanda is his friend and as long as she is there he is glad and receives her ( I wonder what he would do if all of a sudden she wasn’t there?) But I do think that so much of what holds that man back is fear, of loss (all kinds of loss), of being worthy of real love ( not just romantic love), even of being able to have a real friend. A person with that kind of fear just doesn’t jump in and move a relationship along, they tend to hang back and watch things disappear or let things develop on there own, good thing he has got Amanda, but she has her own set of fears. So I guess that now it feels like all the emotions are right there for both of them, but what will they do with them? If they scratched just a bit at the surface it would all be there, like it is in this unguarded emotional moment. But they don’t. And we wait. We could say it is so we can get another season’s stretch out of the slow burn relationship, but you all know I don’t like to think of it that way. So why don’t they scratch at the thin surface? I am glad that they don’t, though because it makes it all grow so much deeper and I think that is very special. No! It’s like chili, or a fine wine, or (‘cos I don’t do wine) a good stinky cheese… it needs time. The ingredients might be there, but they haven’t had time to mature and infuse… (Yes–I’m cooking dinner at the moment. So what?!?!? 😀 ) The checklist (or most of it?) has been checked off–the ingredients are in the mixing bowl–but there’s still cooking time and resting time. “I wonder what he would do if all of a sudden she wasn’t there?” LOL! Is this a test from you? In three of the last 5 episodes we’ve yet to walk through in S2, Lee faces that very question in some way! I’m curious about what you think Lee’s fears are. Why do you think he is afraid of being worthy of real love and of being able to have a real friend? I don’t think I understand what you mean. What would you say Amanda’s fears are? After reading this comment, does anyone else out there have the song “Anticipation” running through their heads? Or maybe just thoughts of Heinz ketchup? And a much better song!! Very cute video – thanks for mentioning! I love the mutual comforting hug!! And then the huge smile!! Awww! So Sweet! Lee does look kind of distraught when looking at Karen’s body. I really think it does push home to him that it could have been Amanda… that he nearly lost her. And when he turns back to her and looks at her for a bit, you can almost see the wheels churning in his brain… yes–Amanda is standing in front of me, yes–she’s OK, yes–the world is right again. I don’t think either of them was unsure about the second hug–I think they both knew that they just went through quite an ordeal and there was nothing wrong with hugging out the excess tension. Oh, and I don’t think that Amanda looked down the first time to break any strong eye tension or anything… I think it’s just an Amanda signature move (until later when her confidence level rises)–another one of her self-deprecating mannerisms. Haha! You are right KC, we will need helmets all around if this wonderfulness keeps up! Oh, there I go again! swoon, thud……sigh….. Regarding Lee looking down at dead Karen and feeling like he’s seeing dead Amanda — I’ve seen a couple of movies where a main character reminded me very strongly of one of my family members. It was very, very difficult to watch those characters in danger, hurt, or afraid. So I can totally see that Lee is going through the same thing. Hi BJo! LOL thanks for the pic – Hmm I’m going to have another go embedding an image it drives me nuts I haven’t been able to do it! Hmm yes very interesting!!! no more Randi’s now eh.. I’m loving all this discussion of where Lee and Amanda are at! It’s funny.. I didn’t see OOADP as being such a big game changer before I revisited it here.. it certainly does move things forward! Yeah I am thinking whatever confusion Amanda is experiencing, she still doesn’t see Lee as looking for a permanent relationship..Very firmly tucked away BJo as you say.. ( in Lee’s arms! 😉 ) yes I agree.. good one.. it did catch her off guard when he was so sweet – that was the big impression I got of her- how ‘in shock’ she was at how sweet he was! Jenbo!!! wonderful to see you here! Hope life’s going okay!! Hope Lee and Amanda and all the swoony goodness gave you a big smile to face your busy day! 🙂 Bliss is a perfect description of that smile.. wow!! I don’t think Amanda is really questioning what’s going on in this moment either! KC yeah! A second hug is brilliant! 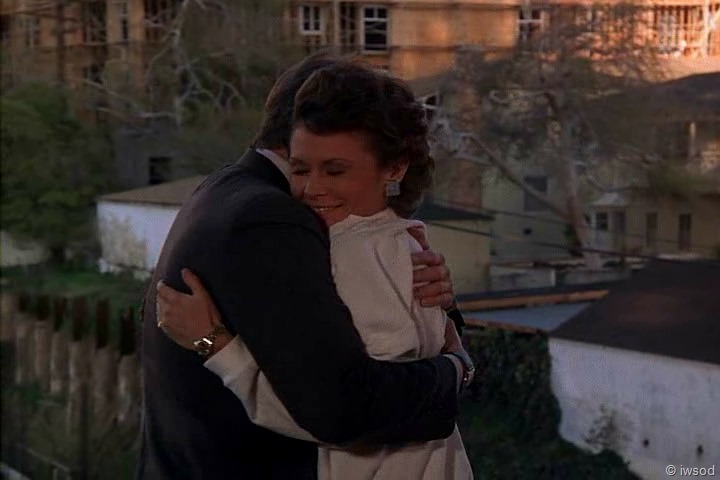 A hug immediately after the drama is not unusual (like the one in A class act..) but to intentionally go back for more? hoo haaaa.. and very sweet! Morley I loved your thoughts- thanks for sharing!!! Glad you liked ‘irreplaceable’ I think you’ve summed up that checklist beautifully!! Can we add the jealousy at Bryce Topping?? Lee seemed to realise that’s what he was doing.. tee hee.. I agree Morley.. Lee still has some things to work through – he isn’t ready for a relationship.. He has seen all of Amanda’s wonderful qualities, but he isn’t ready.. I don’t see it as a plot device to drag things out – I really don’t think either of them are ready to act on what’s happening between them – makes sense to me!! just because it’s there.. doesn’t mean they can or are yet willing to do anything about it! I’m happy to wait! Thanks for summing things up so beautifully! KC is that your like button? tee hee! sooo what’s cooking here hmm?? is it chili? or a maturation process like a fine wine? stinky cheese? ?..good one KC! I’ll say they are making bread 😉 and now is the time for proofing.. then there comes a time where you punch the air out of the bread dough.. knead it a bit.. and leave it in a warm place to proof again 😉 tee hee.. gotta let all that yeast do it’s thing.. and there is definitely something between Lee and Amanda that has a life of it’s own 😉 it’s yeast! te hee..
All the ingredients are there for Lee- in what he sees in Amanda.. but- the dough isn’t ready.. it needs more time.. and a warm place 🙂 tee heee… whoooo I can’t wait to hear which part of this show is the cooking time and the resting time KC 😉 tee heee!! Great questions BJo – what are Lee’s fears?? Come on Everyone!! What do you all think?? what holds Lee back?? I’ll come back to that one myself.. and head off now.. byee everyone! It worked!!!! Hooo flippin Ray!! I love the bread analogy. If the bread doesn’t have the right time to temperature to rise it is a brick. If the dough isn’t kneaded enough it doesn’t rise. All of those parts are important and take the amount of time they take, there is no hurrying a good fluffy loaf of bread. Yes Lee and Amanda are a good hearty loaf of bread! But right now they are a gooey mess of ingredients in a bowl, I don’t even know if it has all been mixed up yet, maybe this hug is some of the mixing. But it is all there, yippee! Hi iwsod, I am slowly going through the series again and just finished Bromfield. But it’s too compelling when I get these delightful messages in my email about what y’all are talking about so naturally I have to skip ahead to participate and swoon with everyone. By the way, totally with you on the early episode order, Brunettes and maybe Class Act have got to come before Bromfield . Am studying verrrrry hard to figure this out so I have to replay every lovely moment of goodness over and over and then check out your wonderful posts extremely carrrrrefully so as to not miss a minute of the divineness and brilliance, hee hee! Keep the goodness coming! I am catching up! We’ve gotta be safe when we swoon! Okay, time to breathe again……just the best post ever!!! Sigh, swoon…thud. I love what everyone has to say about the feelings going on between Lee and Amanda. It seems to be that in some ways Lee is helpless when confronted about his feelings, especially in this scene. Oh, he’ll try to run and hide again, but not very hard. Reminds me of the Backstreet Boys song, “Helpless When She Smiles.” Bjo, love what you said about the dimmer switch turning up for Lee. Great visual! Oh be still my beating heart…….and not because I’ve been hanging on the edge of a building. I think I need to watch more episodes in slo mo. I think I miss too much of the good stuff. Finally!! One of the best moments in the series, if you ask me! Did you ask me? 🙂 And watching it via screen caps is even better!!!! I love watching Lee fall helplessly against his will in love with Amanda. Guess that’s a bit like preaching to the choir, huh? But I am feeling a little light-headed so you’ll just have to skip reading my comment altogether or please bear with me. LOL. 🙂 I wonder if Lee is feeling a little light-headed here too….things are spinning out of control. Ok, back to the business at hand…LOVE how you did this post, iwsod! You really don’t need to say a lot here do you? The pictures really say so much! They are both so relieved and happy that they just need to maintain some sort of body contact to reassure each other that this whole horrible, awful mess is over. I love these screen caps!! Love the two where they are looking at each other just stunned. Love the two where their foreheads are almost touching – can you see the ‘heart’ their bodies form??? Well, maybe a circle, but that’s symbolic too. I think they do have to look away from each other because the moment is too intense! I think Lee is veeery much affected – the dimmer switch has just been turned up a bit for him in terms of his growing feelings for Amanda. Even he can no longer deny that there is something changing him from the inside out. Amanda is just really glad to still be alive but I think she is working to keep her Tupperware stack firmly in place. I don’t see how she could be surprised at his answer to how did he know it was her because the only clue she gave him was the oh my gosh line. Love, love the cap where Amanda is looking down but Lee still just cannot take his eyes off her…his brain must really still be spinning out of control. He is just so damn happy! I love that he completely engulfs her in his arms. He really gets into this hug. Amanda is the one who is leaning in a bit, but Lee is taking all of her in his arms and cherishing her more than ever before at this moment. I think this hug IS different from all the ones before it. First the scene in LOTP where they probably would have hugged had the Burling guy not been between them and now this. 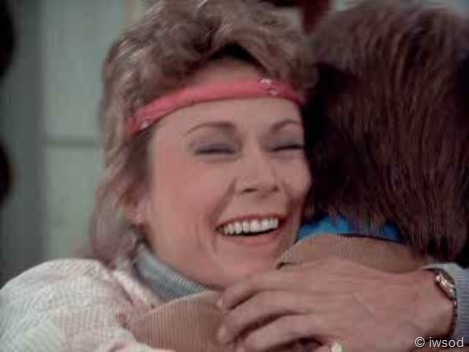 It’s as if this hug has some carryover from that scene as well. I think from here on out the Randi’s of the world are no more for Lee. He now knows what it is like to be so unbelievably happy and grateful to have a woman like Amanda in his life that women like Randi will no longer do. 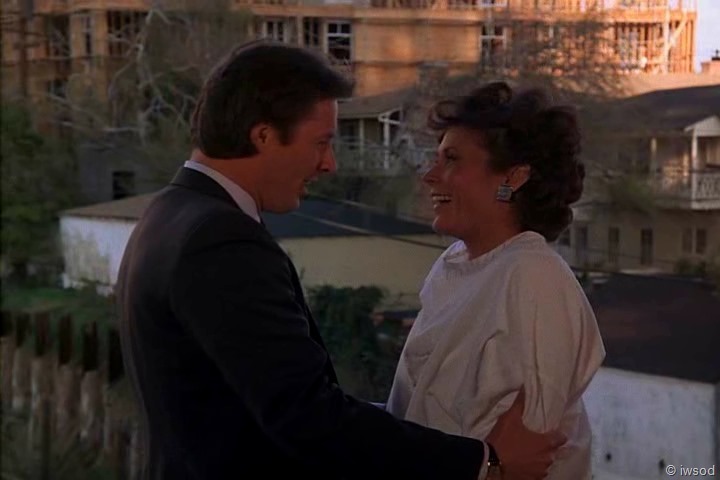 As for Amanda, I think she is still keeping any thoughts of a possible romantic relationship with Lee firmly tucked away. I think for her friendship is all she thinks is realistic with a guy like Lee. 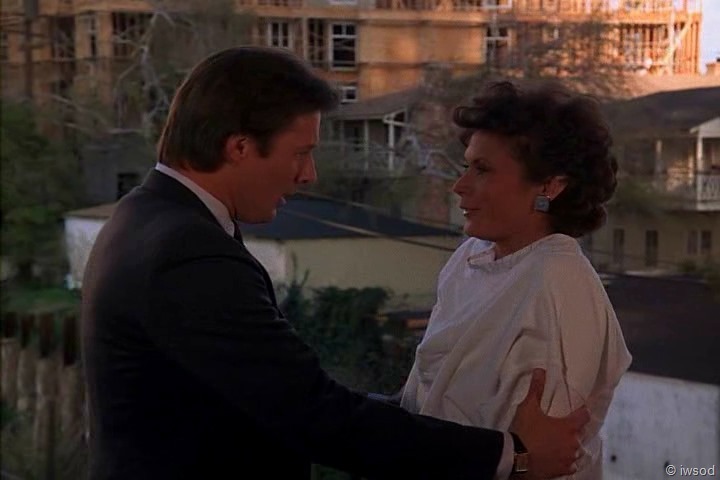 Yes, he was a little sweet with her at the hospital and I think it caught her off guard, but for now she is not willing to go anywhere other than friendship with Lee. Gotta run…my company just sat down to chat….might come back later! I’ve had more time to mull over the post and my comment above. I’d like to add that I think it’s possible Lee might still try for a short while to find an Amanda-disguised-as-Randi type in his fancy restaurants and nightclubs, but would not succeed in finding it because you just can’t beat the real thing. This may sound like I’m hedging a bit, but I’m going to leave my stake in the ground yet give Lee a little time to realize that what I’m saying is true – LOL!!! He may think for now that he wants a woman “like Amanda” but we all know what he really wants – he just doesn’t admit it to himself for a while yet. Hey Happy Camper! I see you thought of I am not now.. 🙂 I’ll add a pic of each of these at the start of the next post okay? we can’t have them not be part of this hug fest! 🙂 Thanks for calling out with that one!! I can see my little tests I throw out there need to be made distinct – so I am not confusing you all with whether or not I am asking because I want to know – or might know and are not sure.. or I know but I’m checking if you know – rofl!! I’ll aim to make that clearer in the future.. but probably 99% of the time I’m asking because I know I could have missed something tee hee..
Hi Conny – yes this hug is as close as you can get 🙂 Glad to see you are with us for the journey! Hey Valerie.. I agree – the ship of spies hug was very sweet.. but this is sweeter!!! 🙂 It makes up for the start of the episode where they were soooo apart no??? now they are very very much together! 🙂 – literally!! I gotta go.. I’ll try and get back and continue responding during my next break! byee everyone! You are so right, Iwsod, so much goodness!! There is so much going on in this without too much being said. After being apart for so much in this episode it is a nice little reunion of sorts. I, too see the gentle rocking and it does happen more down the road. In Ship of Spies we had that quiet Amanda again, in the car and then you see her snuggle up to Lee at the end, but he does put his arm around her at one point and pull her in closer. 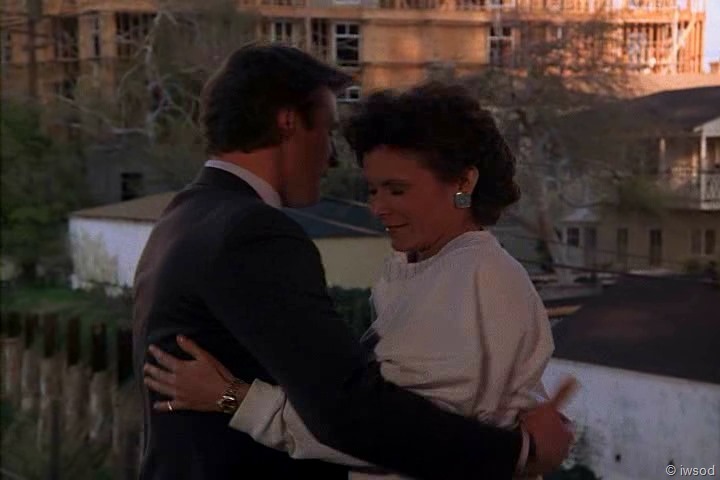 Always liked that hug, it was sweet, but not as sweet as the one in this episode. It’s also nice that they get to share this moment without anyone else around, no interruptions! Favourite, favourite part of this episode is the ending and I doubt they could get any closer in the snuggling/hugging way…more than a bear hug that is for sure. Is this a test to see who is paying attention? You can not honestly have forgotten the Saved by the Bells hug! I just checked, you only needed 3 post to cover that episode, unbelievable!! I think it must be a test, Julia! 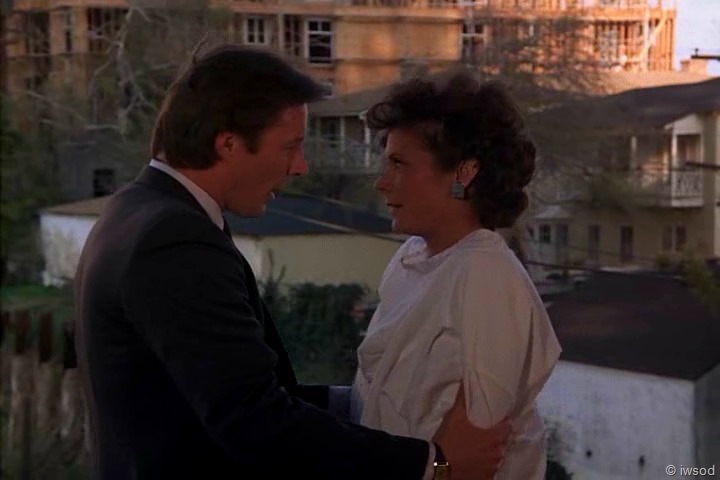 I also think there’s a little somethin’ in the hug after they almost get blown to smithereens in ACAct too. Yes, SbtB came to mind immediately. He is certainly comforting her, and maybe vice versa? hi everyone! I got Julia’s comment last night before I went to sleep so I’ll respond to that and come back later to respond to comments further. big day today! Julia great to see you around!!! But.. Sheesh! I am not that clever Julia! you give me too much credit! 😉 I need help! I don’t have time to do an exhaustive brain and dvd search of all hugs these days (and we are far enough in now there are a lot of things to remember! 🙂 ) So we need some teamwork!!! haaa..
SBTB is a beauty! looking forward to reading what others have said about this hug!!! Though I still don’t see it as the same as this one. 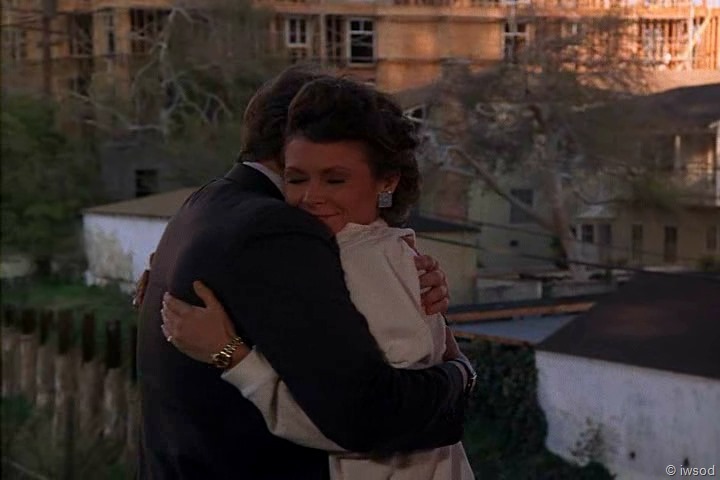 It’s more of a Lee hugging Amanda… anyway.. it is a hug and comforting and lovely.. but it’s also lovely how when you compare it to this hug- this one is more intimate and mutual.. and deliberate.. but maybe it’s just me. oh and yes! LOl you may have seen me mention before that I don’t know how I did them in so few posts.. blogging is a process of trial and error – I think I’ve found a crazy level of detail I’m comfortable with 😉 and to only do SBTB in 3 posts is a tragedy! 🙂 I want to go back when I’ve finished and do season 1 properly in much greater detail.. the dialogue rocks!! Anyway! Hi Everyone I’ll try and get back to comments later today during a break! Love hearing from you all!!!! 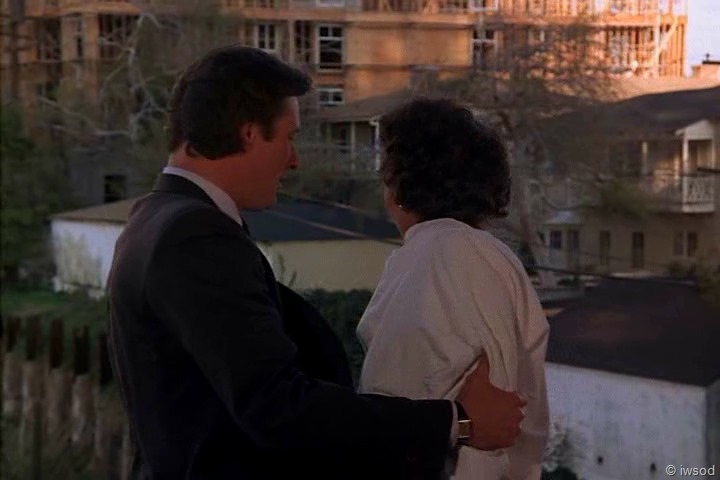 Was watching Geisterschloss for some reason today and saw a comforting hug from Lee after they find Mariana shot in the restaurant. Amanda is upset and as they leave Lee comes up next to Amanda and while he pulls her to him, she leans back into him. 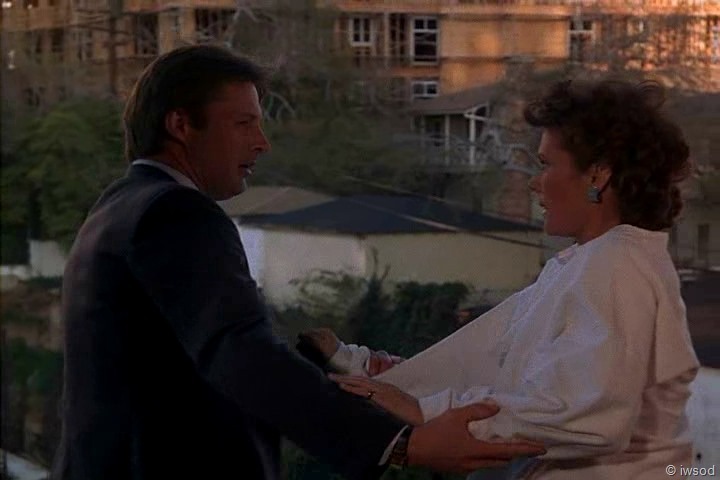 He then rests his hand on her one arm to sort of steady her. It was a tense, but tender moment. 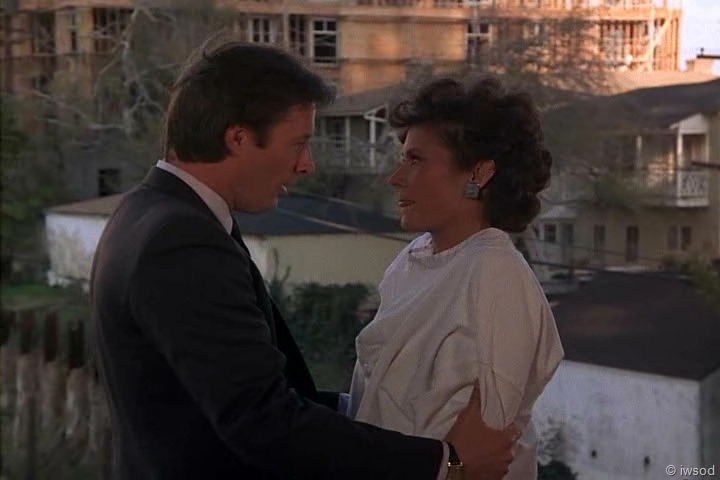 Also, noticed a lot of hand on the small of her back touches. Episode walk start date: TBA. Make sure you subscribe to the blog – I’ll post to announce when the ‘walk through Nightcrawler’ event will be happening!! Hope when the time comes you can join in the fun! 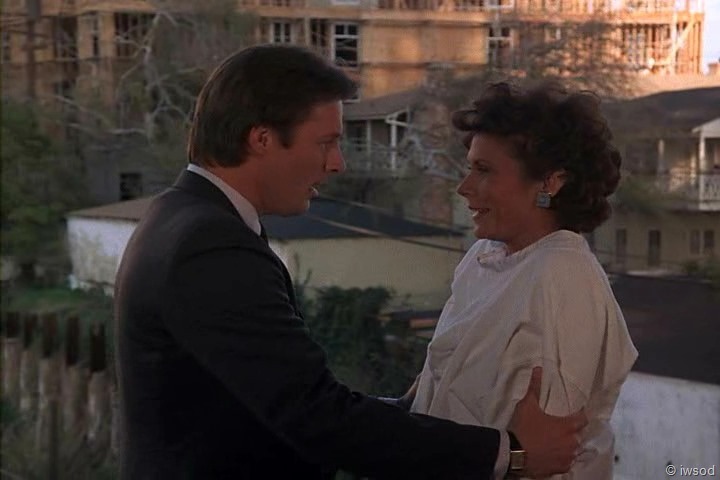 This blog is for the fun and indepth discussion of Scarecrow and Mrs King episodes. ***JWWM does not refer to future events in the show - it stays with the characters on their journey - explores where they are, and what has come before..
Blog Post for Organising ‘re-walks’! Just Walk With Me Update!